SCM muscle pain can affect many areas in the head, face, and neck. Along with pain and stiffness, dizziness can be a symptom of SCM dysfunction. Sternal Division – This is the muscle head that connects to the breastbone (sternum). Clavicular Division – This is the muscle head that connects to the collarbone (clavicle). Where is the Sternocleidomastoid Muscle? The Sternocleidomastoid (SCM) muscles are the two big ropey muscles located at the front of the neck. They attach behind the ear (mastoid) and run down the front of the neck where they split into two heads. One head attaches to the collarbone (clavicle) and the other head attaches to the breastbone (sternum) at the base of your throat. What movements does the Sternocleidomastoid muscle control? Compression by tight collar or tie. TWD Recommends: Do You Sleep On Your Stomach? Stomach sleepers notoriously have problematic SCM muscles and stiff sore necks. 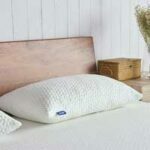 The Sweetnight Pillow has adjustable filling so you can adjust your pillow height and sleep with your neck in better alignment with your spine. You use the SCM muscle to bend your head down, push your head forward, and bend your head sideways, (ear to shoulder). The SCM also assists with chewing and swallowing. The sternocleidomastoid muscle is the muscle most injured in whiplash and as such can cause a number of symptoms and refer pain to many areas of the upper body. The SCM muscle should be examined anytime you have pain in the head or neck area. Often when trigger points are released and the muscle is softened and relaxed, you will find that the pain is considerably reduced or eliminated. If dizziness, nauseous, loss of balance and falling are present and have eluded diagnoses, the clavicular branch of the SCM should be examined for trigger points. Trigger points in the clavicular branch of the SCM can cause problems with balance, vision, and hearing. Biofreeze Pain Relieving Gel is an excellent pain relieving gel and I recommend it for those who have sudden onset muscle pain or recent injuries. It is better than warm therapy gels and creams for recent injury muscle pain as it cools the area much like ice and does not promote swelling. A recent study showed that Biofreeze decreased pain 2 times more than ice and the pain relief lasts 9 – 10 longer. Biofreeze is recommended for those who have had a recent neck injury or sudden onset pain. Rub Biofreeze into the upper back and shoulders, into the front, side and back of the neck going up to the base of the skull and over behind the ears. Highly recommended for early treatment of whiplash. Sombra Warm Therapy Pain Relieving Gel is a pain relieving gel that I use both personally and professionally in my massage therapy practice. Unlike other over the counter heating creams, it provides warmth without burning heat. It can help reduce tightness and pain in the back of the neck and the base of the skull often caused by the sternocleidomastoid muscles. Applying Sombra to the back and sides of the neck, up behind the ears and along the base of the skull will help headache and whiplash pain caused by the sternocleidomastoid muscles. 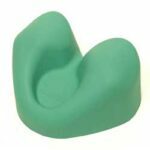 Soothe-a-ciser: Relief for neck and shoulder pain helps relieve pressure and pain in the neck and shoulders. 10 - 15 minutes laying on the pillow allows muscles in the neck, chest, shoulders and upper back to relax and can relieve or even stop some headaches. It can work especially well for those with tight painful sternocleidomastoid muscles, tight pectorial (chest) muscles, people who have slumping upper posture or rounded shoulders and for some who suffer from wry neck syndrome. Do you know that small "knots" and other dysfunction in the sternocleidomastoid muscle can cause pain thoughout the head and neck as well as contribute to vision problems, sinus problems and dizziness? The Trigger Point Therapy Workbook: Your Self-Treatment Guide for Pain Relief is a book that I recommend to those suffering from headaches migraine, sinus, and whiplash pain. The author Claire Davis explains what trigger points are, what muscles are involved in whiplash, headache, migraine and sinus pain and best of all gives you step by step instructions for self-treatment. This is not a miracle cure or 10 minutes fix-it plan, but if you are willing to dedicate the time the techniques can greatly reduce or eliminate your pain. Once learned, you can apply these techniques to other muscles throughout the body at anytime or anywhere nipping the pain in the bud. This book is a highly recommended resource for anyone suffering from headache, migraine, whiplash and sinus pain. The buccinator muscle is located in the cheek. It can contribute to pain in the cheek, upper teeth and mouth. The pain in the upper teeth often feels like an abscessed tooth. It can also cause pain while chewing and difficulty swallowing. The splenius cervicis muscle is located in the back of the neck. It contributes to throbbing pain at the back of the head that extends to the back of the eye. It can also contribute to blurred vision. Sleeping on a pillow that does not provide proper neck support will cause neck and shoulder pain as well as headaches. Using a pillow that is too high or too flat is especially bad for stomach and side sleepers. The Sweetnight Adjustable Fill Pillow allows you to adjust the pillow filling to the proper height you need for better alignment of the head, neck and spine. This pillow works great for all sleeping positions and is highly recommended for stomach and side sleepers. We tend to carry our stress in our neck and shoulders which contributes to pain and stiffness. 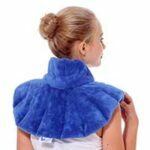 The Huggaroo Neck Wrap is a large wrap that will treat neck, upper shoulder, and upper back muscles. Heat in the microwave for relaxing warmth. Put it in the freezer for cold therapy for injuries and swelling. Do You Have Headaches? A Stiff Painful Neck? The Craniocradle provides gentle pressure and traction to neck muscles to relax muscles and release tension. It works wonders for some headaches giving relief in a matter of minutes. The cradle can also be used on the upper back, lower back and hips. Instructions and links to how-to videos are provided. A great tool to have on hand for those who deal with neck pain and headaches. The Huggaroo Head Wrap is a great choice for those who prefer warm treatment for migraines, headaches, and sinus pain. The wrap is very well made and is covered with soft soothing material that helps hold the heat. The wrap can also be used chilled. The Headache Hat is highly recommended by 2 of my clients who deal with migraines and headaches. The wrap was designed especially for those who deal with migraines and chronic headaches. The wrap holds the cold for hours, some people even sleep in it. It is designed so that the ice can be adjusted within the wrap so you can have the cold therapy where it is most needed. Muscle anatomy of the splenius capitis includes origin, insertion, action, innervation and vascular supply. Actions include agonist and antagonist for each movement. Muscle anatomy of the sternocleidomastoid includes origin, insertion, action, innervation and vascular supply. Actions include agonist and antagonist for each movement.